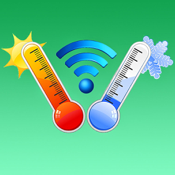 With this app you are able to control the thermostat when you are on your local network. Outside you can instead control the thermostat via a simple web page. iThermo4All comes from a specific need of the visually impaired users, you can control the temperature of their home independently and as "Apple" teaches us "desing for all" is a winning card of “Apple” device.